The afternoon session began with the investor showcase, where venture capitalists from the US and Canada gave insight into the biotech start-up ecosystem. The panel featured Sean O’Sullivan of SOSV, Ganesh Kishore of Spruce Capital Partners, Élizabeth Douville of AmorChem and Collin Kelleher and was moderated by Mary Dimou of Canopy Rivers. The panel emphasized the diverse range of companies that the investors have funded, and the many strategic paths to a profitable startup. O’Sullivan noted that “We’ve seen great companies coming out of Canada and we’d love to see more.” Douville, who represents Quebec-based biotech investment fund AmorChem, encouraged biotech researchers to reach out “If you are an academic investigator with a disruptive technology you should come talk to us.” AmorChem focuses on building companies out of academic research, investing early in promising technologies. The VC investor panel also served as the judges for the Accelerating Startups by Design pitch competition. A new addition to this year's conference, the competition highlighted six synthetic biology startups who presented for both cash prizes, and laboratory resources courtesy of IDT. Canadian startup FREDsense won first place with its synthetically engineering biosensors for water contamination detection. 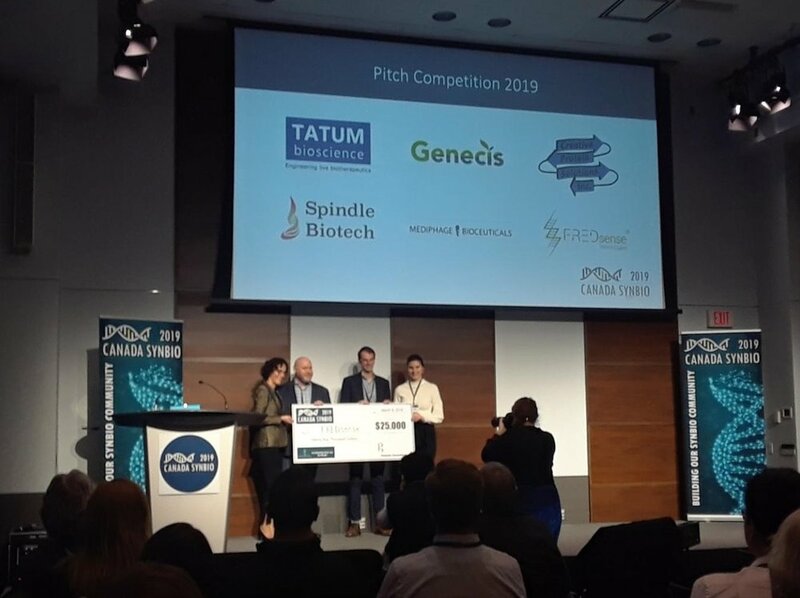 Quebec-based startup, Tatum bioscience, took second place for its engineering of a reprogrammable CRISPR-based targeting of antibiotic-resistant gut pathogens. The other competitors included Genecis Bioindustries, Creative Protein Solutions, Spindle Biotech and Metaphage Bioceuticals. Genecis Bioindustries has engineered bioprocesses to produce a bio-plastic precursors, polyhydroxyalkanoates (PHA’s), from organic waste. Creative Protein Solutions has created a diagnostic device using an engineered biosensor for rapid, onsite monitoring of diseases in cattle. Spindle Biotech is building novel DNA synthesis technology, using specialized enzymes and microfluidics to improve performance and decrease costs. Metaphage Bioceuticals is using DNA mini-strings to engineer a novel trans-gene delivery mechanism for gene therapy, this will ideally increase treatment reliability and decrease the time needed for regulatory approval. In addition to the pitch competition, this year’s conference also featured a student poster competition. 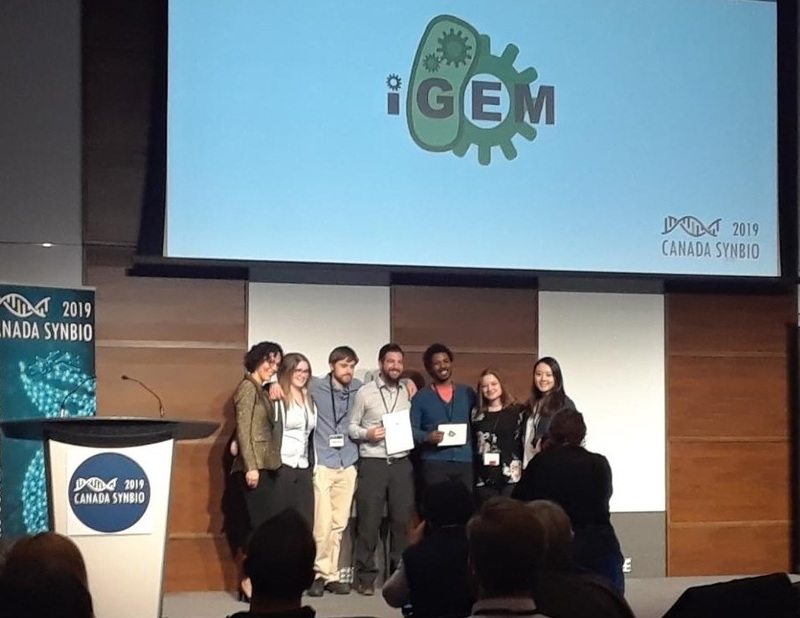 The University of Guelph iGEM team took the top spot, with their work to engineer enzymes to degrade “beer stone”, which is calcium oxalate that builds up in the beer brewing process. Christina Agapakis, Creative Director at Gingko Bioworks gave an exciting keynote talk on the companies ongoing work to make biology easier to engineer. Ginkgo has been a pioneer in scaling up bio-engineering, with 50 Mbp of DNA synthesized each month, and individual projects having as many as 20000 distinct enzymes synthesized and tested. Agapakis noted Ginkgo’s strong emphasis on collaboration between their ‘Foundry’, which performs the automated biological lab work, and their ‘Codebase’, containing the antotations and theoretical knowledge needed to guide and expedite new biological designs. While the foundry uses state-of-the-art automation and parallelization to synthesize and test new genetic designs, the codebase contains data on the functions of proteins and specific DNA sequences which allows for rapid sharing of knowledge between projects. This harmonious interplay has led to a bioengineering version of Moore’s law, known at Ginkgo as “Knight’s Law”, named for Ginkgo and SynBio founder Tom Knight. Knight’s law suggests engineering new genetic designs will undergo an exponential decrease in cost in the near future, heralding an important role for synthetic biology in many industries over the coming decades. “To create a new technology, you are not just engineering the technical part, you’re [also] engineering a social part." Agapakis also discussed Ginkgo approaches to public outreach and its strategy for engaging with the public regarding genetically modified organisms (GMO’s). She suggested the GMO debate is a major hurdle for industrial synthetic biology, and the debate is complex touching on ethics, intellectual property, public policy, philosophy and the very definition of ‘natural’. As indicated by Ginkgo CEO Jason Kelly’s New York Times Op-Ed, Ginkgo has taken the strategy of fully embracing the label GMO, indicating to consumers that GMO’s are not only safe, but something valuable and to be proud of. In an effort to rebrand and take ownership of the term ‘GMO’, the company has highlighted the unique social value of genetic engineering in projects like ‘Resurrecting the Sublime’. In ‘Resurrecting the Sublime’, Ginkgo used its genetic engineering and bioinformatic infrastructure to reconstruct and synthesize odours of extinct plants, enabling them to create scents that without genetic engineering would have been lost forever. Agapakis suggested outreach projects like this, combined with a policy of transparency, will hopefully prompt people to reconsider the social value of genetic engineering. The final panel of the day focused on general aspect of engineering biology. Panelist Vince Martin of Concordia University discussed the recent opening of Canada's first genome foundry. Martin announced it was already expanding, after only a year or so of operation, with plans to enable engineering of mammalian cell lines in the near future. He also stated that since foundries are becoming so popular, the team at Concordia has been fielding questions from other groups around the world. Because of all this interest, half-jokingly he said that his group had suddenly become experts in running a synbio foundry. While the foundry was originally intended primarily for research and training, it was on track to transition to a more accessible service model due to popular demand. 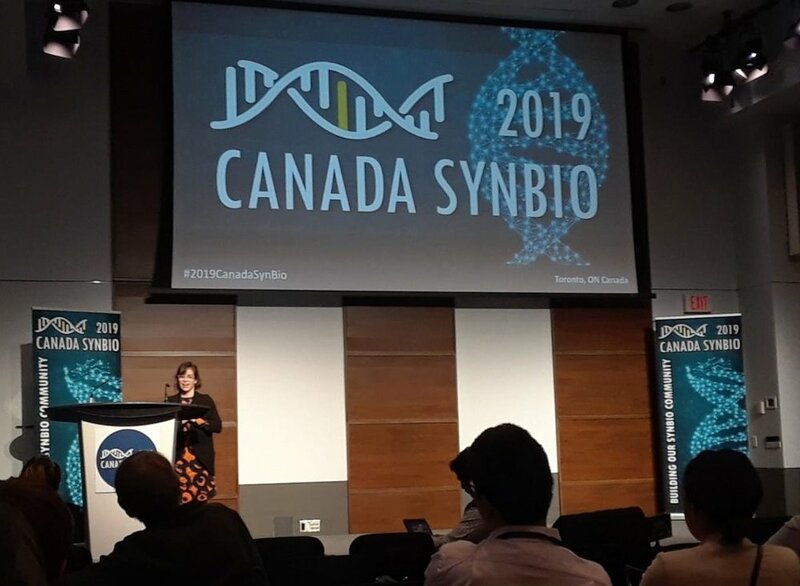 Martin suggest the foundry would increase ‘the number of shots on goal’ for SynBio projects in Canada, by allowing for faster and cheaper DNA synthesis. He also discussed the Concordia Foundries participation in the Global Biofoundary Meeting 2019, which will emphasize standardization and inter-foundry collaboration across the many foundries in other countries. Those interested in the Concordia Foundries services should reach out to its administrative team. Vardit Ravitsky (Université de Montréal) discussed the social and political aspects of more widespread engineering of biology. She emphasized that the ethical debate around genetic engineering often neglects the duty to share the benefits of new technologies. She said their is also an ethical obligation to ask ‘why yes?’. There exists a real risk that a useful technology that can help millions of people will not be developed because of fear. She suggested that a lack of proportional regulation, that balances positive and negative risks, may hold Canada back. Ravitsky also emphasized the duty of Canadian scientists in public outreach. She urged scientists to speak to journalists often, stating that a fear of misquotation or of speaking outside your expertise is not a realistic excuse; it is a “very real part of your job.” She concluded emphasizing the importance of public outreach, and that realistic, grounded communication about the technology is a good safeguard against sensationalism and fear mongering, and the potential regulatory backlash caused by either. Up next is a quick rundown of workshops on Day 2!